Scotch type round-tapered teeth. An old favorite with stockmen. Smooth nickel-plated teeth treat hair gently. Performs many grooming tasks. Easy-grip wood handle. Ideal for horse manes and tails. 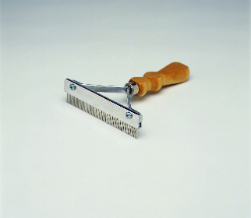 A high quality comb with choice of Fine or Coarse blades.